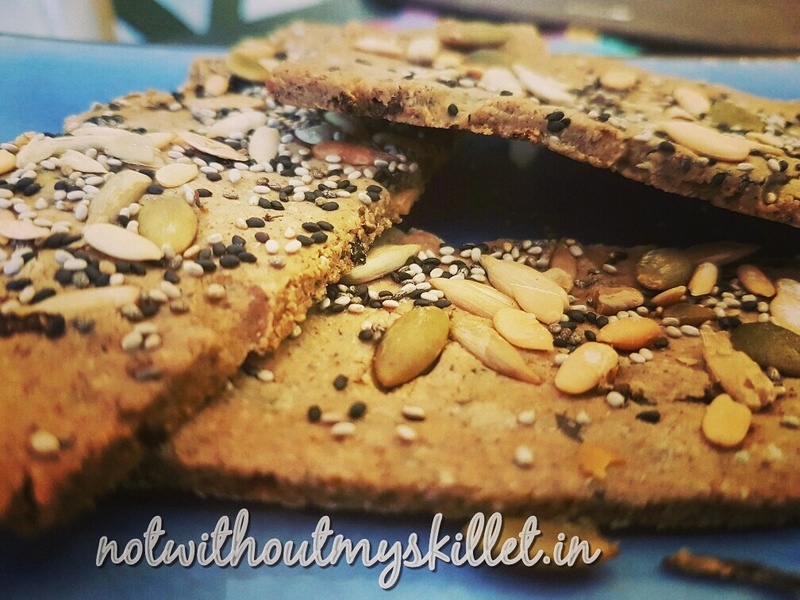 This cracker has been made with 5 flours–oats, barley, buckwheat, sorghum (jowar) and semolina. You could of course use all-purpose flour or a mix of your choice, I just like to keep our pre or post gym evening snacks as healthy as possible. 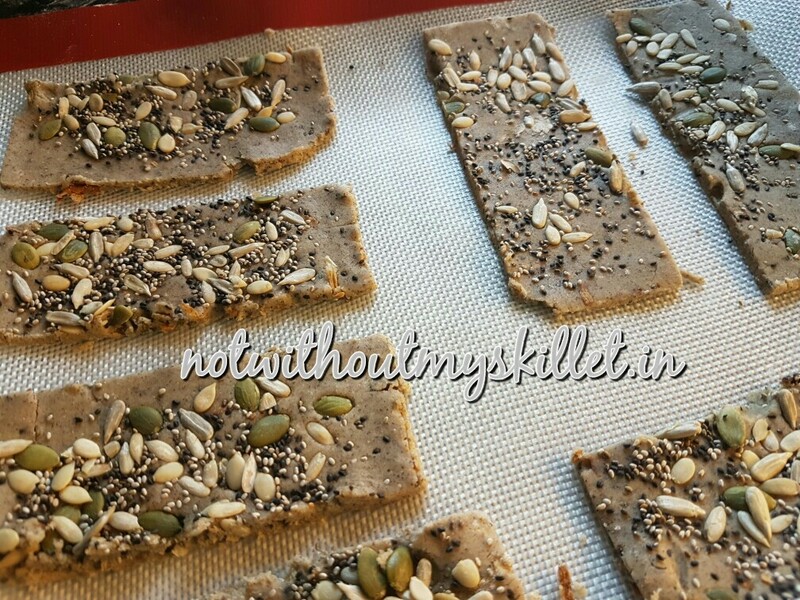 The top has been sprinkled with a mix of pumpkin, watermelon, cucumber, sunflower, sesame and chia seeds. You could use just one type of seed too. Now the important tip here is to sprinkle the seeds on the dough before you roll it off, that’s the only way the seeds are going to stay on the cracker once they are crisp and ready to eat. (I learnt this the hard way…but there’s a tip in the recipe for those of you who forget to add the seeds before they roll it out). For seasoning all I’ve used is dried parsley, salt and pepper. Though I did add a fair amount of dried onion for flavour. 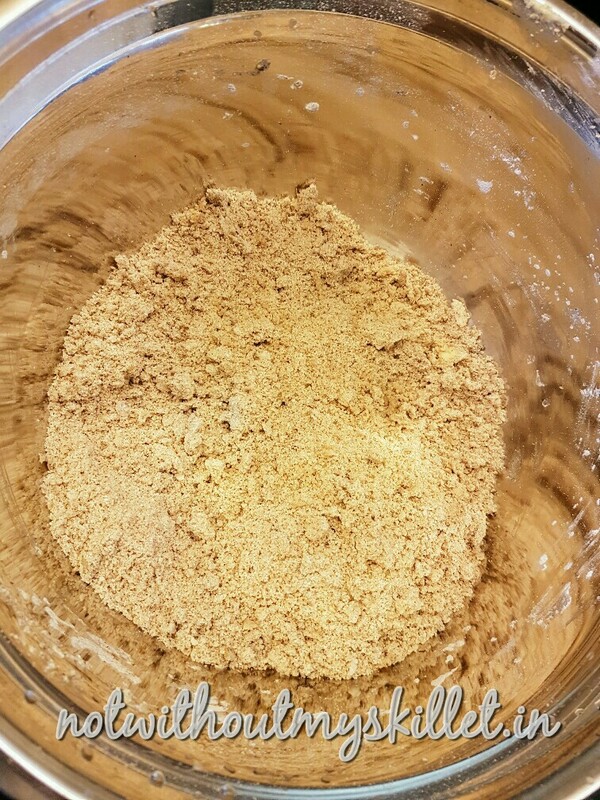 1 cup mix of seeds. 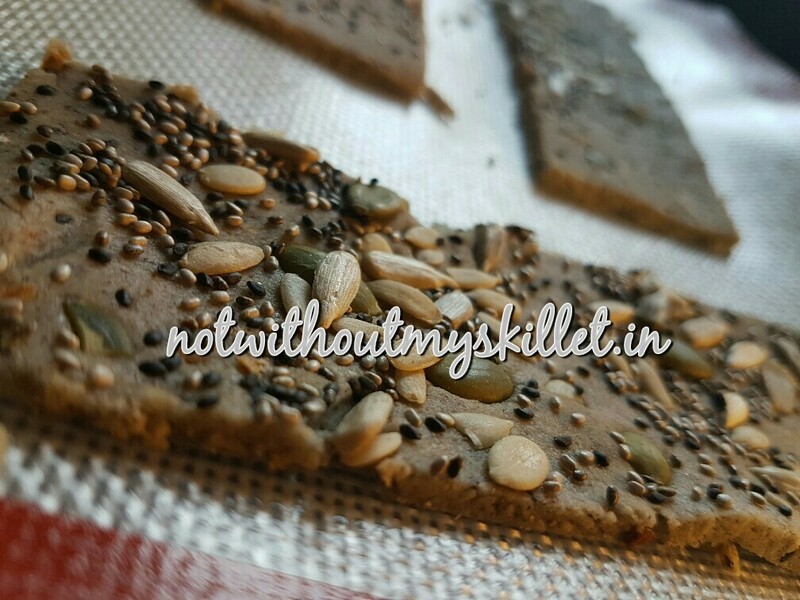 I’ve used pumpkin, watermelon, cucumber, sunflower, sesame and chia seeds. 1. Pre-heat you oven to 170 degree Centigrade. The 5 flour mix with the butter rubbed in. You don’t need to rub in the butter, the end product is delicious and crispy either way. 2. Mix all the flours in a deep pan. Add the salt and cracked pepper. 3. Add 1/4 of the seeds and the butter. Start to bind the flours using as much water as you need. 4. Once the dough is ready, divide it into 3 or 4 equal portions. At this stage you can start to flavour your dough with various combinations. I’ve used parsley and onion flakes, you could use rosemary and chilli. If you plan to use onion and sour cream as your flavouring, remember to add sour cream before you start to bind the dough as it will release enough water to bind the dough. 5. Now you need to roll the dough. 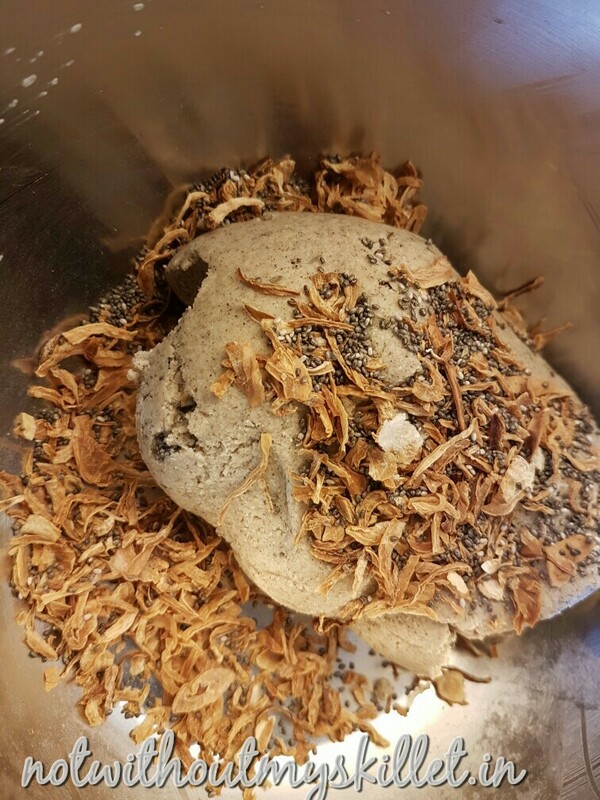 Pay your dough into a disk and sprinkle it with your seed mix. 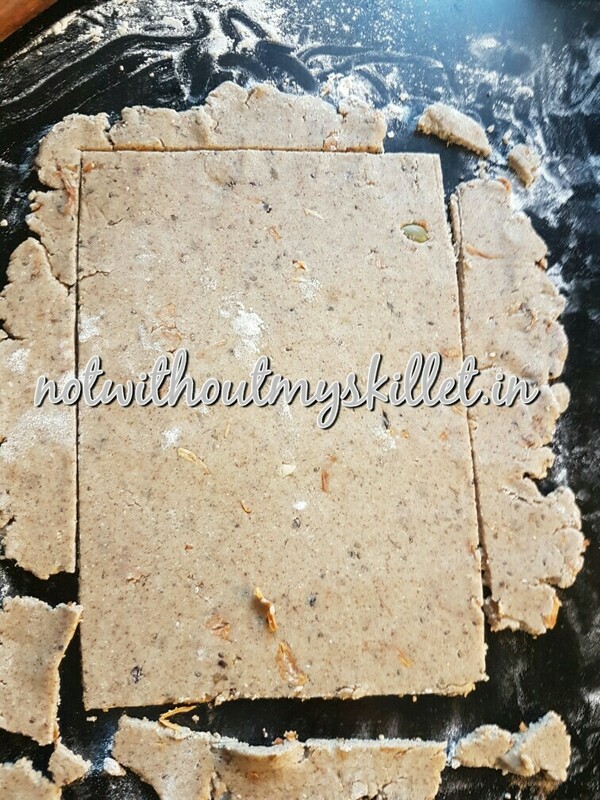 If you are not used to this, place your dough between two butter papers and then roll. Make sure you roll the dough to a flat even surface about 5 mm think. 6. If you’ve forgotten to add you seeds, brush the dough with water and sprinkle the seeds all over the dough. 7. Use a cookie cutter or pizza cutter and cut the dough up into square, rectangular or round pieces. 8. Place the pieces on a silicon mat or buttered and floured baking dish. Bake at 170 degree centigrade for 20 minutes. 9. When done remember to cool them thoroughly before you take them of the tray. Store in an air-tight container. These stay for about a week, if they last that long! Ready to eat, but let them cool off and get crispy before you bite into them.